For the past eight weeks, I’ve looked at a series of comic books that initiated one of the greatest and most clumsily handled mysteries in the history of Spider-Man. 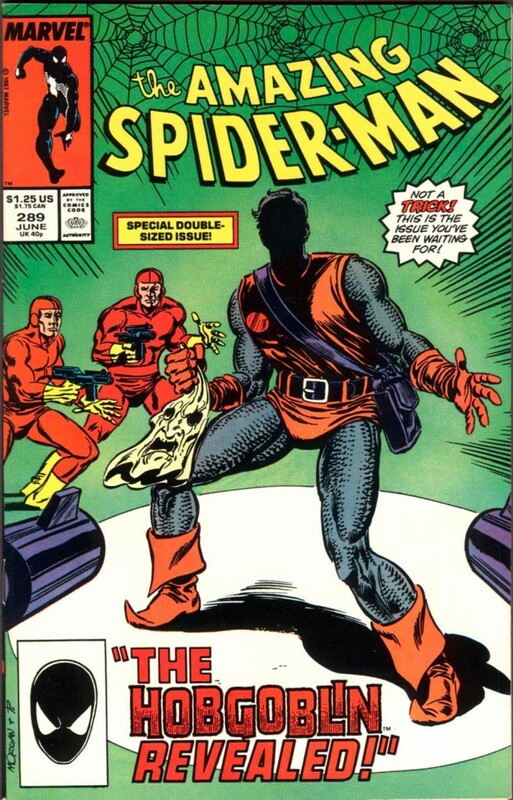 There are tons of scattershot accounts of how the identity of the Hobgoblin was supposed to pay off – including a few more courtesy of Tom DeFalco, Danny Fingeroth and Jim Salicrup that are part of our Superior Spider-Talk podcast series – but the short version of the story is that there were a number of conflicting interests colliding with each other behind the scenes at Marvel during this time period. While we all derive pleasure (hopefully) from our comic book reading experiences, there’s an old saying about not wanting to see “the sausage get made,” because if you did you’d probably never want to eat sausage again. From the time the Hobgoblin character was first introduced in Amazing Spider-Man #238, different creative teams were playing with a host of suspects, namely wealthy businessman Roderick Kingsley (who Roger Stern preferred) and the Kingpin’s son Richard Fisk (who Tom DeFalco/Ron Frenz preferred). Fisk eventually revealed to be The Rose, purple-mask wearing crimeboss, by another creator Jim Owsley (now Christopher Priest). P.S. DeFalco wanted Kingsley to be the Rose. 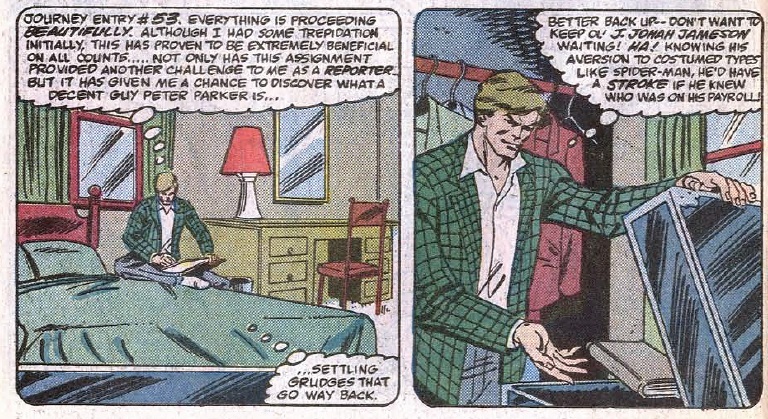 But as people say of the best laid plans of mice and men … in the special double-sized Amazing Spider-Man #289, Peter David, a great writer in his own right, handled scripting duties, and based on some of the evidence that had been presented – mostly by Owsley in his short stint on the book before he was unceremoniously fired – David revealed the Hobgoblin to be Ned Leeds. The problem with that was Owsley KILLED Ned in his Spider-Man vs. Wolverine one-shot a few months earlier in very un-supervillain-like fashion reportedly as a way to screw with DeFalco and Frenz. After all this build, revealing Ned as the Hobgoblin was like waiting 15 years for a new Star Wars movie and getting a film about a little kid and a digitally-animated talking duck-person. Yes boys and girls, long before the days of the “Clone Saga,” and “One More Day,” and Amazing Spider-Man #700, there was ASM #289 which outraged the fan base and had people “swearing” off Spider-Man. When speaking with Jim Salicrup, group editor of the Spider-Man titles at the time, at Connecticut ComiCONN two weeks ago, he openly admitted that the reveal was handled very poorly, in large part because of all of the conflicting interests and egos driving the story in a myriad of directions. The person who I think gets the shortest shrift in this whole debacle is David, who writes the best story he can possibly come up with given the circumstances and toxic nature of Marvel. I would actually argue that David wrote a helluva story (and said as much to Salicrup when I interviewed him, in which he acted like it was practically the first time a fan had ever said that to him in a public venue). ASM #289 hits some really nice beats and the only thing that reads somewhat awkwardly is unfortunately, the reveal itself which is the selling point of the entire comic. But there’s some great Spider-Man/Peter moments, and a really fantastic sequence involving Peter and Flash Thompson which convinces him to continue on as Spidey despite wanting to give up the webs again. If you judge ASM #289 as a story, and not for the story behind the story, it’s a really fun read, which is not surprising because Peter David wrote it! And just to play devil’s advocate, in the series of issues leading up to ASM #289, there was a ton of evidence suggesting Ned was the Hobgoblin. 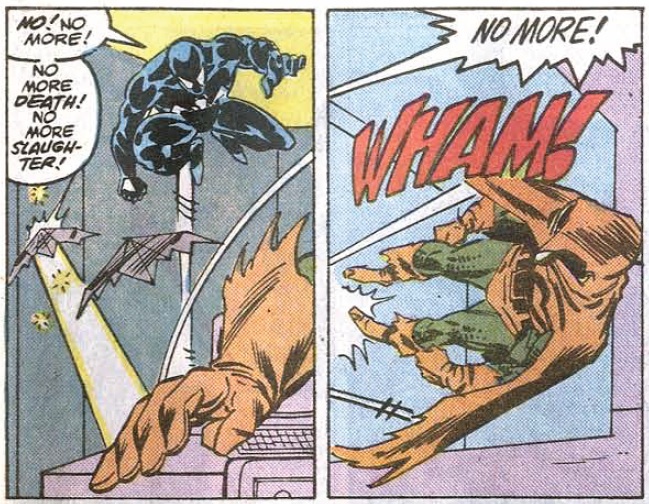 First, there was the whole storyline involving Flash getting framed as the Hobgoblin. Flash had been having an affair with Ned’s wife Betty and also was recorded on television calling the Hobgoblin a creep. The affair obviously didn’t sit well with Ned, who vowed revenge, and who was acting increasingly more erratic around the Daily Bugle office. In fact, the Spider-Man vs. Wolverine one-shot may be the sanest Ned had been portrayed in months, and then of course he gets killed. During our interview with DeFalco, he mentioned that his intention was for Ned to be a “red herring” to throw people off the scent of Richard Fisk. The only problem is that there isn’t a lot of Richard Fisk in these issues to justify him being an actual suspect. Reportedly, a lot of the Fisk content being plugged into these comics by DeFalco and Frenz was left on the cutting room floor by Marvel’s editorial staff (namely Owsley). So, who else is David supposed to turn to beyond Ned? It’s hard to consider him a red herring when there aren’t many other suspects at this point to incorporate. Of course there’s a mountain of evidence that indicates that it couldn’t possibly be Ned, but with all of these creative teams trying to take the Spider-Man universe in so many diverging directions, it’s not like the case against Ned is all that more definitive than any of the other characters being brandied about as suspects. 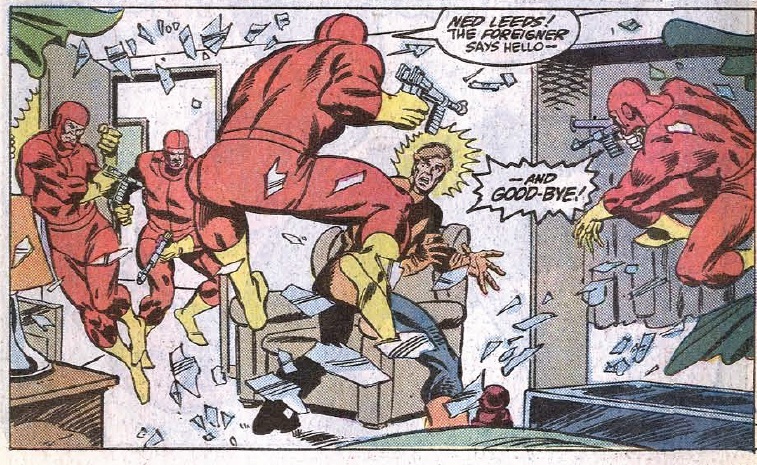 For me, I have two main issues with Ned: in the comic where he’s killed by the Foreigner’s goons, he’s surrounded and killed way too easily for a guy who has superhuman strength and earlier withstood immense physical damage during his battles with Spider-Man. In all my years of comic book reading, I can’t think of a single supervillain who was killed by strangulation by a dude in a mask using a wire. The other issue that no one seems to talk about when Monday Morning Quarterbacking this story is the fact that Stern reveals very early in his run that the Hobgoblin is very wealthy and resides at a large estate on Long Island. As someone who worked in a newsroom for a number of years, I can’t imagine the Bugle was paying Ned THAT well (and if they did, they certainly couldn’t afford to pay reporters that salary with today’s circulation numbers). I also think the justification for Ned’s motivations as outlined in Web of Spider-Man #29-30 by Owsley (we’ll get to that later this week), are a little silly. 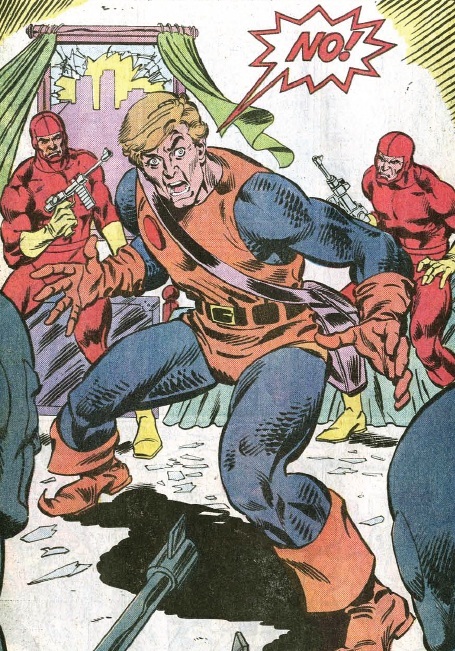 It didn’t help that after killing Ned off, Marvel immediately replaced the Hobgoblin with Jason Macendale, who had been gallivanting around NYC as the generally uninteresting Jack O’Lantern villain. Marvel couldn’t even wait five issues before having someone new take on the mantel as probably their most famous villain from (the first half of) the 80s? Still, as I said earlier, if you go back and just read ASM #289 as a solitary issue, and not as the culmination of this back-and-forth drama (in many ways, the drama behind the scenes was greater than what was written into the comics), I think you can make a case that the comic is a great read. Like a few other writers tackling Spider-Man at the time, David dives right into the psychological aspect of the character. The scene where Spider-Man’s world is spiraling out of control after learning from Kingpin that Ned was the Hobgoblin is just phenomenal writing. 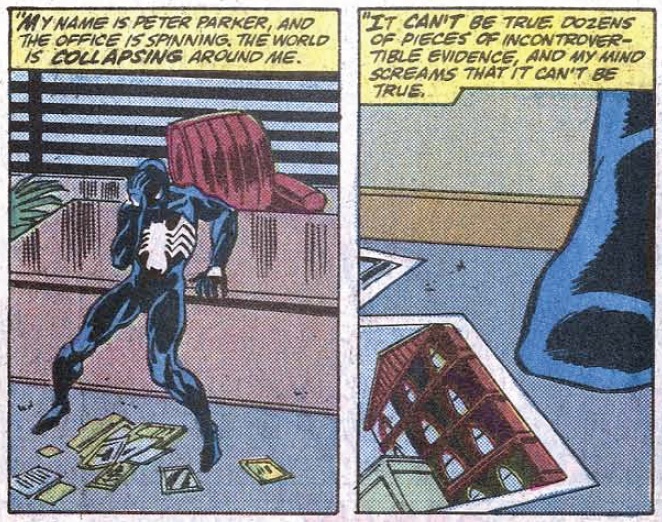 Spider-Man has been chasing down this character for years and he reacts exactly as I expect/hope he would when he discovers the mystery villain was someone who had been close to him this entire time (without spoiling anything, I’m sure Breaking Bad fans can appreciate this storytelling device). Additionally, the scene between Flash and Spider-Man towards the end of the issue may go down as my favorite Flash moment of the entire series. Flash is still on the run from police after escaping from prison and doesn’t know that his role in the Hobgoblin drama has essentially been cleared. When the Jack O’Lantern/Hobgoblin confronts Spider-Man, a disheveled Flash has the wherewithal to toss a pumpkin bomb back towards the villain in order to save his long-time hero Spidey. 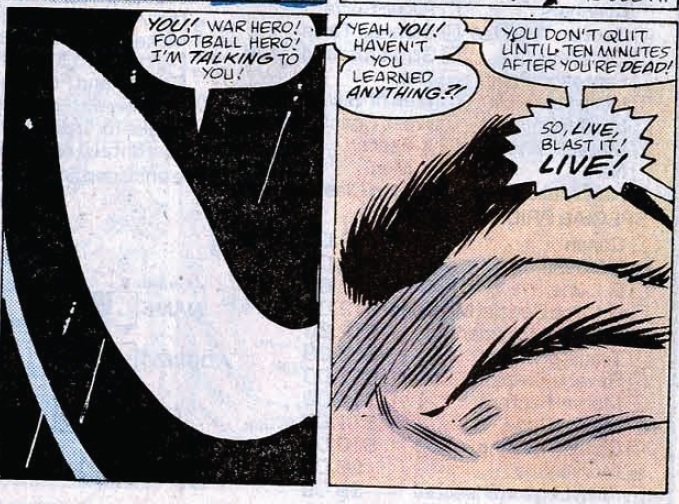 The blast seriously injures Flash, so Spider-Man jumps to the rescue giving him CPR (and setting a so-so breath mint joke from Peter later on) and DEMANDING that Flash not give up and hang on. What I like so much about this scene is that while he’s saving Flash, Spider-Man is 100 percent Peter. He is face-to-face with a guy who has probably caused him considerably more grief in life than good, and yet he knows Flash’s bullying came from a place of strength and ego. So having Spidey be so forceful with Flash in order to maintain the guy’s will to live is very powerful stuff. But I imagine all anyone will ever want to talk about when ASM #289 is brought up is the fact that Marvel botched the Hobgoblin reveal. The fact that they released a retcon 10 years later by Stern (more on that later this week) only further rubbed salt in the wound in this comic’s legacy. I’m sure if this storyline was just being released today, I would be on my blog cursing the name out of whichever creator who wrote this letdown of a story. But with more than 25 years of hindsight and perspective to fall back on, I’m not going to take that stance today.